One of the first things Cindy-Lyn mentioned is how she has found that sharing her story and talking about her experience has really helped her on her breast cancer journey. She admits that while this may not be for everyone, it has helped her to unload some of the trauma and stress of it all while also helping others who have recently been diagnosed to not feel so alone. Cindy-Lyn found that documenting her journey on Facebook helped to express her emotions and explain the process along the way. Her breast cancer story began on 11 May 2017 when Cindy-Lyn went for a check-up – she had found a lump in her right breast but thought it was merely a cyst. What unfolded within the next 24 hours was unimaginable to her and her family – her life would be forever changed after being diagnosed with breast cancer. 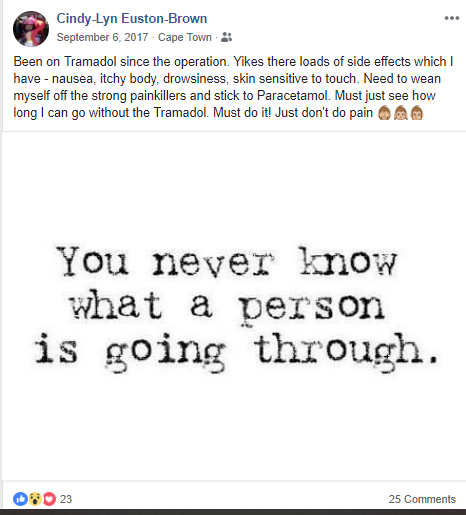 She had no idea that she had an infiltrating lobular carcinoma, four tumours and loose lying fragments, altogether totalling 50x50x30mm in size – not great news for anyone, let alone someone without medical aid! On 08 August 2017, just three months after her diagnosis, Cindy-Lyn underwent a double mastectomy at Groote Schuur Hospital. A representative from Reach for Recovery, Valerie Lamb, came to see her that same day bringing some goodies to make the hospital stay more comfortable, including holders (to put her drains in) and a little cushion to go under her arm. While she wasn’t really in the mood to speak to or listen to anyone at the time, she was soon persuaded by her loved ones to give Reach for Recovery a chance – something she is grateful she did. 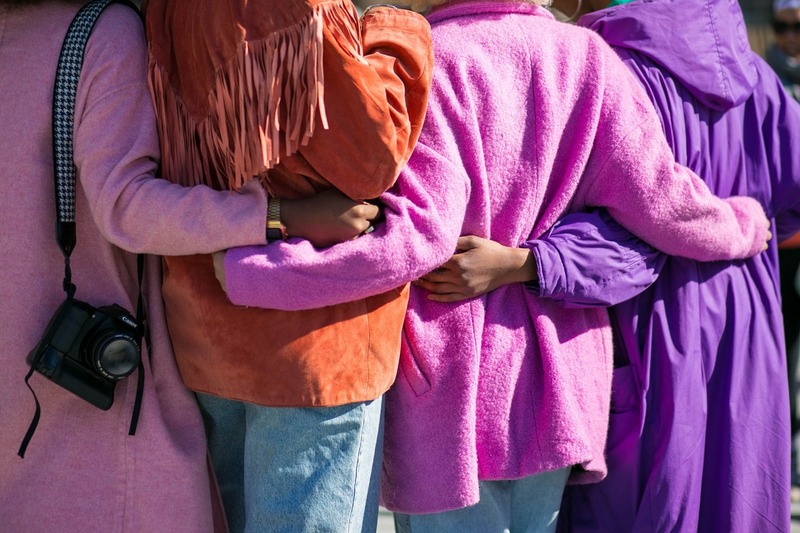 She met Carla Lind, Regional Representative for Reach for Recovery in the Western Cape, at their offices after realizing it would be good to speak to someone who understood what she was going through. Carla helped her to understand the various stages that those diagnosed with breast cancer endure, from the grieving period all the way through to acceptance. Being a patient at a government hospital, Cindy-Lyn was able to qualify to receive protheses from The Ditto Project which she received in March 2018. She explains that the process was simple and involved finding a bra, having pockets sewn into it and then selecting the prostheses (with assistance). “I was surprised to find out that they were the weight of real breasts,” she tells me, giggling. She admits that she doesn’t wear them all the time but that it’s really nice to have the option to wear them, particularly for certain clothes, and that they are really comfortable. 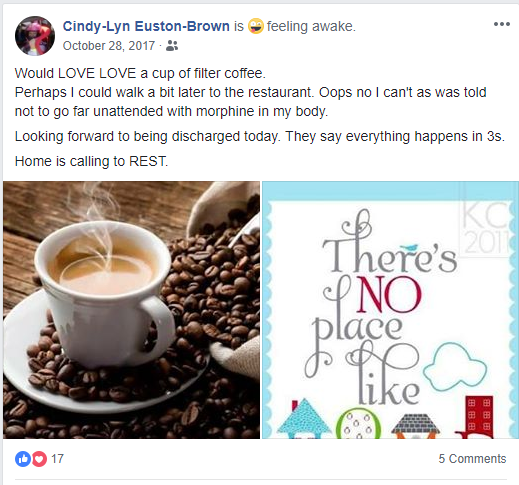 “I am forever grateful to Reach for Recovery for their Ditto Project as it helps one’s confidence after a traumatic time to have some boobies back – even if they are a prothesis,” adds Cindy-Lyn. Reach for Recovery, the NGO behind The Ditto Project, is run solely by volunteers, most of whom are breast cancer survivors themselves. But not just anyone can become a volunteer – there is a stringent interview process and training that one has to undergo which ensures that all volunteers are equipped to assist and support breast cancer patients to the best of their abilities. Cindy-Lyn lets me know that she is incredibly excited as she will be interviewed to become a volunteer later in October. 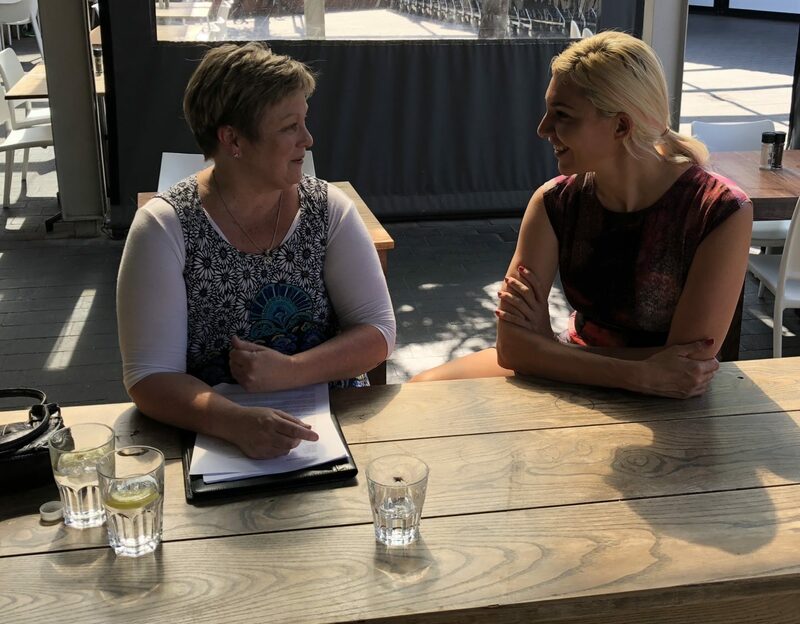 Cindy-Lyn has been through a lot – from numerous operations to radiation – and I was blown away by her persisting positive outlook and openness to sharing her story. She believes that there needs to be a holistic approach to tackling breast cancer, from diet to medication and everything in-between! She has been on a long journey of self-awareness and believes that her support group, positive outlook and ability to share her story is what keeps her moving forward.